Come home to our warm, welcoming premier care center nestled within a quaint Kenosha neighborhood. We are located centrally amongst all Kenosha Hospital Systems . While the neighborhood surroundings ensure peace and quiet to promote healing, you will also have access to an active social life with plenty to do such as attending concerts, bingo, crafts and much more. Crossroads Care Center of Kenosha can meet your high quality long-term care, short term rehabilitation as well as Respite Care needs. You will find caring and well trained professionals, who are dedicated to meeting your clinical needs while providing the most friendly person centered care. 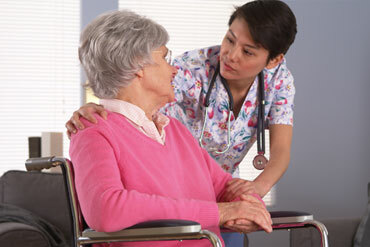 Our licensed and certified staff include Physical, Occupational and Speech Therapists. These Professionals, in combination with our clinical team and Medical Director, ensure not only the highest quality of care for all, but also a safe and speedy recovery and return home for our short term rehabilitation patients. This collaborative approach, also ensures the highest quality of life, independence and person centered care for everyone we have the honor of caring for. Giving Care. Taking Care. There is always something to do in scenic Kenosha boasting a vibrant harbor, beaches and quaint downtown coffee shops. Art Galleries and various restaurants that have something for everyone to enjoy. The outdoor venues include the weekly Kenosha Pops concerts, Kingfish baseball games and weekly Farmers Market. All of this of this and much, much more in this vibrant lakeside area. Relax in our exquisitely landscaped private backyard and patio, socialize in one of the lounges or snuggle in with a good book. We also offer a beauty salon and have flat screen televisions connected to cable, wireless internet access and dedicated phone lines for each resident. Healthy and delicious dining is an essential part of a happy and healthy lifestyle. Our professional kitchen staff works with our dietician to customize flavorful and nutritious menus that fit the dietary needs of each of our residents while creating dining experiences reminiscent of the meals prepared in mom’s kitchen. We boast a large variety of person centered activities to ensure fun for everyone. We host an annual picnic each year for friends and families and shopping trips to your favorite stores. We feature Arts and Crafts and the Music and Memories Program as well as our very own Annual Art show. We have live musical entertainment monthly as well as special Birthday celebrations. Also featured are exercise and chair dancing classes, as well as Bingo, Birthday and Holiday celebrations and visits with Harley the Therapy Dog. Crossroads Care center of Kenosha also provides religious and Spiritual services if you so choose to participate.